IMPACT Children’s Theatre, Jean’s Playhouse’s renowned touring children’s theatre troupe, will continue their summer touring season this week with Snow White and Rose Red, July 24-29! SNOW WHITE AND ROSE RED are generous and kind. Confronted by both a dwarf and a bear, one day, the girls are in awe when things resolve unexpectedly. Based on the story by the Brothers Grimm. Upcoming stories include Momotaro: Ogre Hunter (July 31-August 5), How the Rainbow was Made (August 7-13), and the final show of the season: Humpelken-Pumpelken or the Adventures of Humpty Dumpty (August 14-19)! 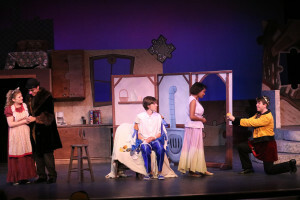 Attached Photo Caption: IMPACT Performs Thumbelina last month at Jean’s Playhouse!